Freedom of choice is a highly valued concept in the western society. At its simplest, it could be defined as the possibility to choose from at least two options without being affected by external parties. We didn’t mean to go all dominant supervillain on you. To make amends, we have two really cool major updates for you in this patch. MAJOR UPDATE II: We added Apple Watch support. 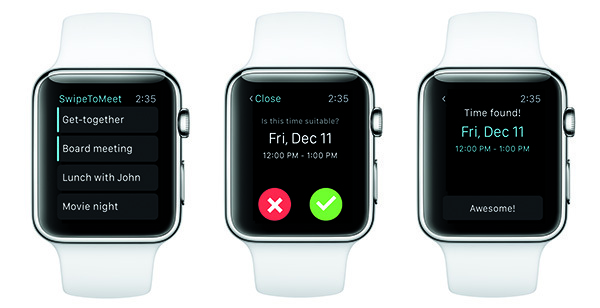 This is huge as it makes SwipeToMeet the first social scheduling app available for Apple Watch. (At least so far as we can tell.) Now you can take part in scheduling with only a twist of the wrist and a tap of the finger. New: Auto-pick time is a new switch in the scheduling setup. It disables the new organizer swiping and automatically picks an available time from your calendar. Fix: Navigating to participant list while loading drove the app into a limbo of unloaded meeting information. Gladly our engineers were able to solve this with their magnificent skills. Fix: Connecting a calendar in the swiping screen did not work properly even though it appeared to do so. This evasive ninja-like-bug was squashed without mercy. Fix: We used to show you load of gibberish and nerd speak in the occasional error messages. In this version we really did our best to translate them to English. I’m telling you, that’s not as easy as one might think. Fix: Additional minor fixes to copy around the app. Hopefully you will find these updates as exciting as we. Let us know what you think!